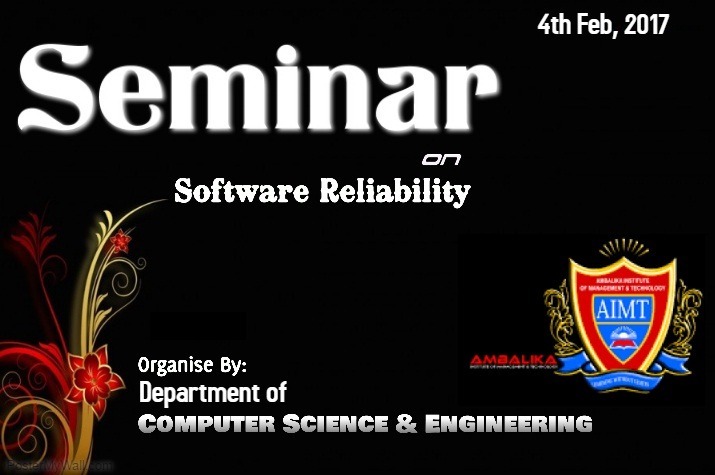 We are pleased to inform you that the Department of Computer Science & Engineering is organizing a Seminar on “SOFTWARE RELIABILITY” on 4th February 2017. The key Speaker is DR. AJEET KR. PANDEY (L&T Technology Services, Bangalore, India). Dr. Kumar is post-graduate in Computer Science & Engineering from MNNIT (Motilal Nehru National Institute of Technology), Allahabad (India). He has done Doctorate in Reliability Engineering from IIT (Indian Institute of Technology), Kharagpur (India). He has about 16 years of experience in System Assurance and RAMS, immersed with Transportation Industries with cross-functional integration of Railways Systems and Infrastructure. Professional member of IET, UK and IEEE, USA, contributed by writing research papers and articles on the subject, delivered many invited talks for industries and academia. He has contributed to many National and International Metro and Rail Projects- DMRC-Line 8, Sao Palo Line 6- Brazil, Doha Metro Project, Sydney Metro Project, Network Rail (UK), Hyderabad Metro Project (India), and Invensys Rail UK & USA. He has visited Japan, Australia, Qatar, during his stay with many companies such as D’Appolonia S.P.A. UAE, Alstom Transport, Bangalore, India, AECOM Hyderabad, India, and Cognizant Hyderabad, India, Relia System Hyderabad, India, L&T Technology, Bangalore, India.